CTM owns all of the intellectual property rights existing in the brand Country & Town. CTM shall take any action that it deems necessary to protect its intellectual property rights and this Website. If you breach any of the terms in this legal notice, your permission to use this Website automatically terminates and you must immediately destroy any downloaded or printed extracts from this Website. In addition CTM shall be entitled to pursue a claim for damages or any other appropriate remedy. The 'Country & Town’ logo incorporating the screw device' is a registered trademark property of Country & Town Limited. 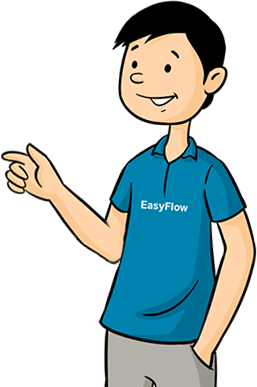 The 'EasyFlow' logo is a registered trademark property of Country & Town Limited. 'Percy Pipe', 'Victor Voltage', 'Rene Renewable' and 'The Adventures of Victor and Percy' are registered trademarks property of Chris Tomlinson. The original artwork of the characters 'Victor Voltage', 'Percy Pipe' are copyright protected with the copyright being owned by Chris Tomlinson. The 'NICEIC Domestic Installer device' is a registered trademark property of NICEIC Group Ltd. The 'Water Industry Approved Plumber device' is a registered trademark property of 'Water Regulations Advisory Scheme' WRAS Ltd.
CTM, except where indicated, owns all copyright, design, text, images, graphics, database rights and other intellectual property rights that may exist in the content appearing in this Website or any part of it (“Materials”). You may view and/or download the Materials only for the purpose of non-commercial use provided that all copyright and proprietary notices contained in the original Materials or copy thereof shall be retained. Any use including, but not limited to, reproduction, republication, modification and distribution of the Materials for public or commercial use without CTM's prior written consent is strictly prohibited. Links to and from other websites This Website may contain links to other websites including those owned and operated by third parties. These links are provided solely for your convenience. If you use these links, you leave this Website. CTM has not reviewed all of these third party websites and does not control and is not responsible for these websites or their content or availability. The Company therefore does not endorse or make any representations about them, or any material found there, or any results that may be obtained from using them. If you decide to access any of the third party websites linked to this Website, you do so entirely at your own risk. The purpose of the Website is to promote the services of CTM. Any information on this website is not to be regarded as a legally binding offer by CTM to provide services. When you make a request to purchase any products or services, this will be regarded as an offer to be accepted or rejected by CTM. It will be at the sole discretion of CTM or its contractors as to whether to accept your offer and it shall be subject to our / their terms and conditions. Visitor Conduct You are prohibited from posting on this Website any material that is threatening, defamatory, obscene, indecent, offensive, pornographic, abusive, libellous, and discriminatory or other material which may cause offence or annoyance. It is essential that any information you provide to CTM during the course of using this Website is accurate and true to the best of your knowledge and belief. You agree to indemnify CTM for any loss it suffers due to any misrepresentation, misdescription or non-disclosure of any material fact by you. CTM does not guarantee that this Website will be available 24 hours a day and CTM shall not be liable if for any reason this Website is unavailable at any time or for any period. CTM may suspend access to the Website temporarily and without notice in the case of system failure, maintenance or repair or for reasons beyond the Company's control. whether in tort (including without limitation negligence), contract or otherwise) in connection with this Website in any way or in connection with the use, inability to use or the results of use of this Website, any websites linked to this Website or the material on such websites, including but not limited to loss or damage due to viruses that may infect your computer equipment, software, data or other property on account of your access to, use of, or browsing this Website or your downloading of any material from this Website or any websites linked to this Website. While CTM endeavours to ensure that the information on this Website is correct, CTM does not warrant the accuracy and completeness of the material on this Website. No information on this Website constitutes legal or professional advice and should not be relied upon in any way. Governing Law and Jurisdiction These Terms and Conditions shall be governed by and construed in accordance with English law. Disputes arising in connection with this legal notice shall be subject to the exclusive jurisdiction of the English courts. This website is targeted at residents of the United Kingdom only and the content and information provided on this Website may be illegal in territories outside of the United Kingdom. If you are not a resident of the United Kingdom access to this Website is prohibited and CTM request that you do not use this Website.